0.314" (8mm) dia x 0.630" (16mm) long. Set of 25 pcs. C8 Ceramic Cylinder / Rod Magnet, Magnetized through the length. Not plated. 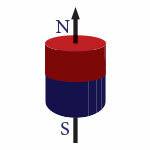 Safe Magnet Practices: Magnets are a valuable resource to engineers, innovators, product designers and DIY professionals. Always practice safe handling and keep away from children at all times.